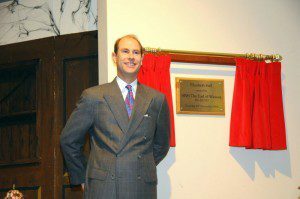 On 27th November 2008, the new Elizabeth Hall was officially opened by HRH Prince Edward, Earl of Wessex. Representatives of many of the hall’s user groups were present. After the opening, Kate and Ted Blackman planted a tree in the grounds, in recognition of the many years of service that they had given to the old Elizabeth Hall. Photographs of the occasion were taken by Pete Bryan and Alan Bowman.